My interest in metal sculpture began in 1970 when I bought my first welding outfit and began teaching myself, through trial and error, how to weld and create sculptures. I perfected my welding and metal working skills in varying degrees of intensity and at different locations through-out the country. It wasn’t until 1996 when I began displaying my work in the Colorado Springs locale that I began to seriously pursue sculpting and began displaying my work in galleries and shows. My methods of design and fabrication are largely self-taught and have been perfected over time. The primary media I use is mild steel which can be texture, highly polished, accented with brass, copper or covered with a colorful patina. 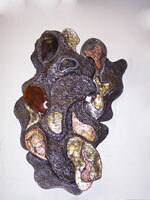 Unlike cast sculptures where the detail is created in the clay and then captured in the mold and then cast, I weld metal together and create detail by moving puddles of molten metal, called beads, to provide the desired effect. I have also added slab glass and granite into my designs. Thus the end product is truly one of a kind which I sign with a round brass dot into which the letter “D” is stamped. 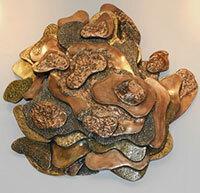 I use the title of the piece to help the viewer visualize what I am trying to convey in the sculpture. 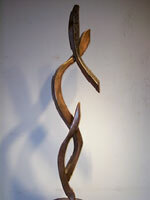 All of my sculptures are designed to challenge, amuse and capture the eye of the viewer and I do encourage touching. I work out of my studio at 1603 A S. Wahsatch Ave Colorado Springs. 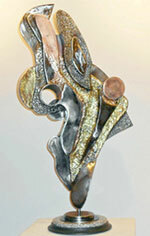 My vision is to exploit the properties of various metals, patinas and stained glass so that the viewer can enjoy both the tactical and visual aspects of the sculpture. My work if it had to be categorized would be between abstract and representative art. The titles of my work provide the viewer with an insight to the nature of the work.